Output devices are pieces of computer hardware used to communicate the results of data processing performed by a computer. The objective of output devices is to turn computer information into a human friendly/readable form. There are many examples of output devices, each with their own benefits and drawbacks. What is a display screen? Display screens are amongst the most common types of output device. Thanks to the development of LCD technology, display screens now require less power and are lighter and thinner than their obsolete CRT ancestors. LCD screens produce sharp high resolution images. 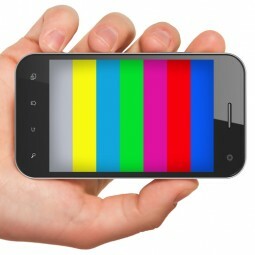 Most display screens are either LCD or LED. Details of these can be found below. LCD screens are made from millions of tiny blocks called pixels. Each pixel contains a red, green and blue light filter which can be individually adjusted to create any colour when combined. This is possible because the liquid crystals found in each pixel can be manipulated to allow all, some or none of the fluorescent tube back light through to the individual RGB filters at the front of the screen. LED screens work in a similar way to LCD screens but with one major difference, the light source. Small LED bulbs are used to provide light to the LCD pixels, not fluorescent tubes. These LED bulbs either fill the entire back of the display unit, or on thinner models are just arranged around the edges. A fully back lit LED display allows for localised diming of the screen, producing deeper blacks in parts of the screen where no light is needed. Edge lit LED displays allow the screens to become even thinner than standard LCD displays. In some situations LED screens are more power efficient than LCD. Data projectors are output devices used to project the digital output from a computer device on to a large screen or wall. The user can usually choose whether the projector mirrors their computer screen, extends it, or replaces it. Projectors are ideal when training or presenting information to a large audience. 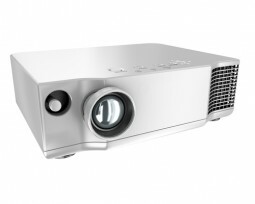 Prices are very reasonable for basic projectors, however, a data projector capable of showing cinema films or sports footage in a bar are far more expensive. Data projectors come in two mains types, 3LCD and DLP. The differences between these are detailed below. The lamp light is split from white into red, green and blue using dichroic mirrors. The RGB light channels are passed through separate monochrome LCD screens, one for each of the three colours. The RGB light is then reassembled into a single light beam and magnified out of the projector using lenses. It is the three LCD screens that therefore control how much red, green and blue is present in the final image. DLP projectors work in a different way to LCD projectors. Most affordable DLP projectors use a fast spinning colour wheel filter to sequentially split the lamp light into red, green and blue light. The projected image is created by a bank (chip) of thousands of microscopic mirrors. Each mirror represents one pixel. These tiny mirrors are carefully in sync with the colour wheel, turning towards or away from the RGB light as and when it is needed, thousands of times per second. So, if part of the projected image requires no red light, they face away from the light when the colour wheel filter is allowing red light through. The reflected image from the mirrors is then magnified out of the projector using lenses. 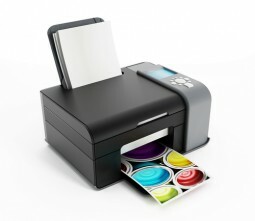 Inkjet printers are output devices usually used in a home or small office for low volume printing. A moving print head sprays ink droplets on to the paper from a cartridge filled with liquid ink. Thermal bubble technology is used to fire these microscopic ink droplets from the cartridge. Because the bulk of the action happens in the high-tech ink cartridges, they are priced quite highly in relation to the price of the actual printers (which are often very affordable). Inkjet printers are now commonly combined with a flatbed scanner to create an all in one solution. 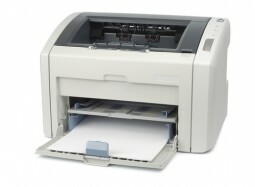 Laser printers are output devices usually found in businesses and organisations. Using static electricity, the way they work is completely different to inkjet printers. Laser printers use a powdered ink/toner cartridge, not liquid ink. The rotating printing drum is given a positive charge. A laser removes the positive charge from certain areas of the drum as it scans across it, creating a negatively charged copy of the text/image to be printed. On an ink roller, the toner is given a positive charge which attracts it to only the negatively charged areas on the printing drum. The toner then transfers from the negatively charged areas of the drum to some positively charged paper. A fuser is used to heat the document and permanently melt the toner on to the page. Laser printers are ideal for high volume printing because they produce very high quality documents at fast speeds. 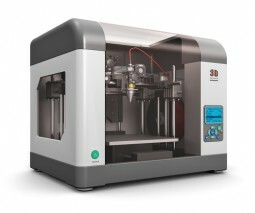 3D printers are output devices used to create three dimensional objects from a 3D computer model. The computer model can be created by using a 3D scanner, or by hand using CAD modeling software. Using a method called additive manufacturing, 3D objects are created by layering a material, layer by layer, from the ground up until the object is completed. 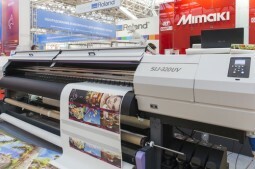 A wide-format printer is an output device capable of large scale printing. Most wide-format printers work in a similar way to inkjet printers, allowing for some flexibility with the materials that can be used. 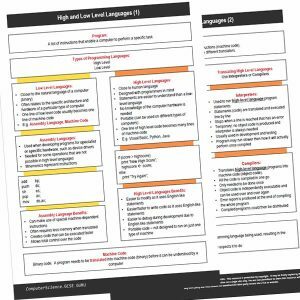 Wide-format printing is economical when printing a larger item in small volumes as setting up a traditional print run can be expensive. What is a 2D cutter? A 2D cutter is an output device capable of cutting holes or shapes into a flat 2D surface. 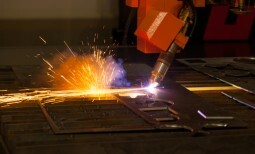 Examples range from inexpensive paper/card cutting machines used by craft enthusiasts, to industrial models used in manufacturing to cut through metal. What is a 3D cutter? A 3D cutter is similar to a 2D cutter except it is capable of rotating and cutting at many angles. This means that 3D objects can have cuts made to all of its surfaces, unlike 2D cutters that can only cut into a flat 2D surface. 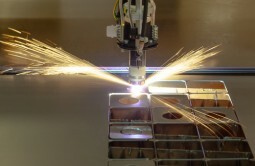 3D cutters come in many varieties, some of which do not use lasers. What are speakers and headphones? Speakers and headphone are the output devices responsible for producing sounds. Speakers and headphones convert digital signals into analogue sound waves that are audible to our human ear drums. Speakers come as standard is most portable computing devices. 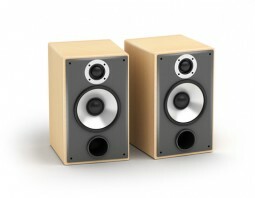 Desktop computers usually require the purchase of separate speakers. Speakers and headphones aren’t just for music, they also allow us to hear computer warning signals and other people when communicating via voice or video calls. Actuators are the output devices responsible for creating real world movement. This could range from physically opening automatic shop doors to lowering the landing gears on a plane. They are often used in a computerised control system, acting upon a signal sent by the microprocessor. 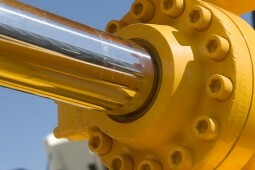 Actuators include electric motors, pistons and pumps.